Retaining walls must be designed so that foundation pressures do not exceed allowable bearing pressures, wall settlements are tolerable, safety factors against sliding and overturning are adequate, and the wall possesses adequate structural strength. Methods for evaluating earth pressures on retaining walls and design procedures are summarized herein for cohesionless backfill materials, which should be used whenever practicable. Learn how to design for sliding forces acting on retaining walls.. This course is intended for civil engineers, structural engineers, geotechnical engineers, geologists and other design and construction professionals wanting an introduction to methods and techniques designing retaining walls and excavation support structures.. This course will give engineers and other design and construction professionals an introduction to design of retaining walls and excavation support structures. 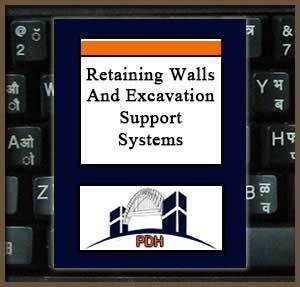 This is an introduction to methods for design of retaining walls and excavation support structures. This course will give you an introduction to the design and construction issues for excavation support structures and retaining walls.